It is nothing but elevated pressure inside the eyeball. In clinical terms, it is defined as the presence of elevated intraocular pressure (IOP) in the absence of optic nerve damage or visual field loss. Normal intraocular pressure is between 10mmHg - 21mmHg. The most commonly seen complication of ocular hypertension is glaucoma. It is characterised by having multiple eye disorders including optic nerve damage, loss of vision field, and permanent damage to vision leading to blindness. It is called as "silent thief of sight". Signs and symptoms include gradually progressive visual field loss, optic nerve changes, ocular pain, seeing halos around lights, redness of eyes, nausea and vomiting. Prevention- After the age of 50 years and those who are having diabetes and hypertension need to check for intraocular pressure every 6 months to 1 year without fail to prevent complications like glaucoma. Loss of vision can be prevented by early detection of glaucoma. I am having eye pain and discomfort even after using new glasses. Kindly help. All these eye disorders are explained in ayurveda in sarva akshi roga – abhishyanda and adhimantha. Sekam- pouring of medicated liquid over closed eyes from a specific height. Pindi- Bandaging a medicated bolus over closed eye for a stipulated time period. Bidalaka- Applicaton of medicated paste over the eyelids for a stipulated time. Computer Vision Syndrome is caused due to prolonged use of computer. Signs and symptoms include eye strain, redness of eyes, dry eyes, irritation in the eye, head ache, neck pain and dizziness. Prevention is by "20 20 20 rule" i.e, every 20 minutes, focus the eyes on an object 20 feet away for 20 seconds. Otherwise, it is advised to close the eyes for 20 seconds, at least every half hour. In ayurveda, netra tarpana, siro pichu, shirodhara give very promising results. DES is nothing but excessive dryness in the eyes, caused due to decreased tear production or increased tear film evaporation. Signs and symptoms include pain, redness, dryness, itching, tearing, irritation, foriegn body sensation in the eyes. Prevention - continously blink the eyes, avoid straining the eyes, reduce the exposure to dry or dusty environment, avoid prolonged usage of computer or mobile. In ayurveda treatment includes snehapana, nasya, tarpana, ghrita aschyothana and ayurvedic seka. It includes carrot, papaya, grapes, musk melon, amla, squash, green leafy vegetables, egg, milk, fish and meat. Reduce the intake of salts, pickles, reduce the screen time i.e, use of computer, television, mobile phones. Use proper lighting while working and reading. 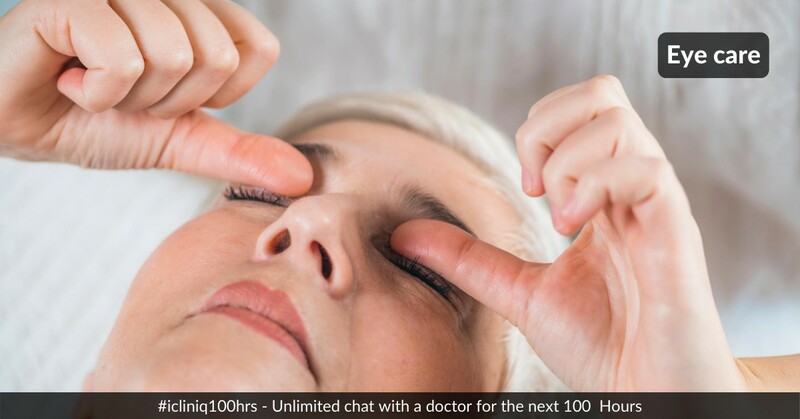 Do regular eye exercises, yoga, trataka (concentrating at a particular point) to improve your vision and to correct the eyesight without glasses and surgery. Ayurvedic Medicines for Healthy Eyes: Triphala, yashtimadhu, lodhra, amalaki , jeevaniya ghritha, durva ghritha, and saptamrita lauha.